Your oral health is important to the success of your Orthodontic treatment. Red, swollen gums that bleed, and bad breath are signs of Periodontal Disease (gum disease) – a bacterial infection of the gums. Your oral hygiene (homecare) is critical, especially during Orthodontic treatment. Daily brushing, oral irrigation and flossing will keep dental plaque and tartar to a minimum, but a professional cleaning will remove bacteria and calculus in places your toothbrush and floss have missed. There is no cure for gum disease but there is treatment. Traditionally, 3 month alternating maintenance visits with your periodontist and general dentist will minimize re-infection. Dr. Morris and his staff are trained to recognize the signs of early infection prior to bone loss: lack of tissue contour, changes in tissue consistancy and color variations. These are just a few of the signs that signify the inflammatory process associated with recurrent periodontal disease. Our goal is to help you maintain your smile and investment for a lifetime. The following is a prescription for your oral health both during and after braces. Periodontal disease and tooth decay(cavities) usually occur between the teeth where your toothbrush cannot reach. Flossing is a very effective way to remove plaque and food debris from those surfaces. However, it is important to develop the proper technique. The following instructions will help you, but remember it takes time and practice. During braces, a floss threader or ‘superfloss’ may be needed. To clean the upper teeth, hold the floss tightly between the thumb and forefinger of each hand. Gently insert the floss tightly between the teeth using a back-and-forth motion. Do not force the floss or try to snap it into place. Bring the floss to the gumline then curve it into a C-shape against one tooth surface. Slide it into the space between the gum and the tooth until you feel light resistance. Move the floss up and down on the side of one tooth. Remember there are two tooth surfaces that need to be cleaned in each space. Continue to floss each side of all the upper teeth. Be careful not to cut the gum tissue between the teeth. As the floss becomes soiled, turn from one finger to the other to get a fresh section. When you are done, rinse vigorously with water to remove plaque and food particles. Do not be alarmed if during the first few weeks of flossing your gums bleed or are a little sore. If your gums hurt while flossing you could be doing it too hard or pinching the gum. As you floss daily and remove the plaque your gums will heal and the bleeding should stop. This needs to be done once every 24 hours or after sticky trapped food between your teeth. Our office recommends that everyone uses a sonic powered toothbrush. These devices will help you clean better around brackets and bands during braces. Keep in mind you may need to replace toothbrush heads more frequently while under treatment. If a hand toothbrush is all that is available then the following is recommended: Use a soft, sensitive or ultra-sensitive bristle toothbrush. While brushing the outside surfaces of your teeth, position the brush at a 45-degree angle where your gums and teeth meet. Gently move the brush in a circular motion several times using small, gentle strokes. Use light pressure while putting the bristles between the teeth, but not so much pressure that you feel any discomfort. Next, you will clean the biting surfaces of your teeth. To do this use short, gentle strokes. Change the position of the brush as often as necessary to reach and clean all surfaces. Try to watch yourself in the mirror to make sure you clean each surface. Then gently brush the top of your tongue with the bristles reaching as far as possible to the back of your tongue and gently pull the toothbrush outward until the entire surface has been brushed, careful not to gag yourself. After you are done, rinse vigorously to remove any plaque you might have loosened while brushing. This should take two to three to four minutes to complete if you have all of your teeth. We recommend you use an ADA approved toothpaste. We do not recommend tartar control or whitening toothpastes. These tend to be more abrasive and over time could damage your teeth and cause increased tooth/root sensitivity. If you have any discomfort while brushing or have any questions about how to brush properly, please be sure to call the office. Our office recommends the use of an oral irrigator to effectively reduce harmful bacteria, debris, and microscopic particles between the teeth and below the gumline. The unit is especially useful in removing food particles around crowns, bridges, orthodontic brackets and dental implants. Fresher breath can be expected when one uses an oral irrigator during braces because they can remove food that can otherwise be trapped for hours. Some patients may not be able to use the oral irrigator due to health conditions. Listed below are medical conditions that will not allow you to utilize an oral irrigator. Our office will help you if you have any quetstions. Mitral valve prolapse, artificial joints and heart valves, cancer patients on chemotherapy, history of rheumatic fever as well as some immune disorders. Please contact your dentist, physician or our office if you have questions. Plug in unit into a 110-120 volt A.C. outlet. Fill the resevoir with lukewarm water almost to the top &/or fill line. Insert the jet tip into the opening on the handle. Turn pressure control knob to the ‘low to medium’ or ‘1-6’ number setting depending on your experience with the unit. Insert tip into your mouth, lean your head over the sink and then press the on/off button to start the water flow. Let the water flow out of the mouth while leaning over the sink. Do not move head around too far, as this will cause a mess in your sink vanity area. Direct the stream of water toward the gumline at a 90 degree angle, so that contact with the jet tip is made where the tooth and gum meet (gumline). Maneuver the flow of the water from tooth to tooth remembering to pause breifly at each tooth starting from one side and continue to the otherside. Start on the cheek side of the teeth and then go to the tongue side of the teeth of one arch and then do the same for the other arch continuing in this formation until all the water is gone. Depending on the reservoir size, the number of teeth you have present and/or the amount of restorative (crowns, bridges, implants, braces) work present in your mouth you may need to fill the reservoir two times during each use. The oral irrigator should be used once every twelve hours or first thing in the morning after breakfast and in the evening before bed, unless otherwise prescriped by our office. 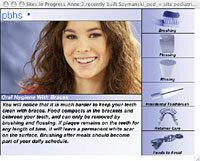 The use of a proxybrush may be needed to clean spaces between certain teeth or orthodontics brackets. The proxybrush looks like a ‘pipecleaner’. There are two different shapes, a cylindrical one and a triangular ‘Christmas tree’ shaped one. The interproximal space is the triangular shaped space where the gum tissue grows between teeth. Sometimes this space may be absent of tissue which allows food and bacterial debris to collect and grow in a space protected on each side by the walls of the teeth. Some bacteria produce acids that cause tooth decay and others produce chemicals that cause gum inflammation. During your periodontal cleaning visit, we point out areas that are of concern and teach you the best technique for attacking these bacterial strongholds. We might include in your dental plan prescription or over-the-counter fluorides, mouthwashes, prescription antimicrobials or other medicines that aid in the health and healing of your gum tissue. Periodontal disease is very complex and once you’ve achieved health, the right tools and chemicals are needed to maintain the condition. For example, fluoride can help strengthen your teeth during orthodontics. Dr. Morris will recommend the appropriate rinse or toothpaste depending on your specific situation.